Neutrophil and trapped bacteria. 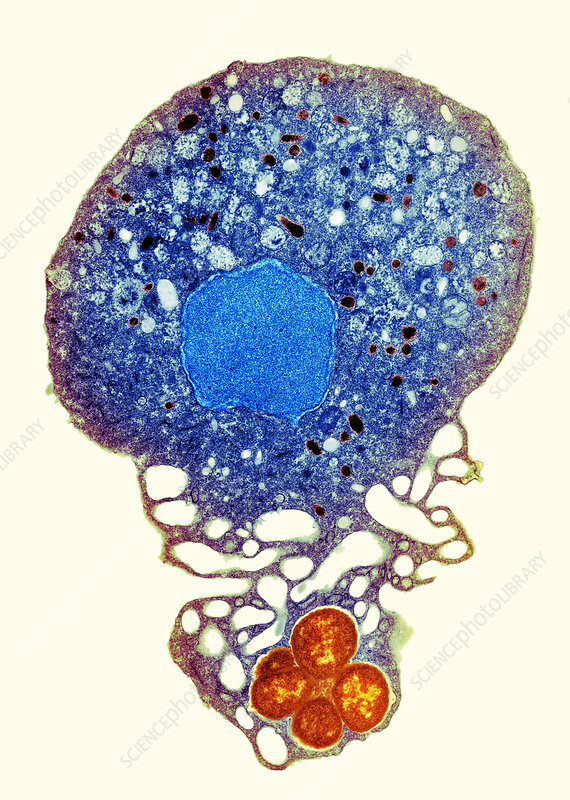 Coloured transmission electron micrograph (TEM) of Neisseria gonorrhoeae bacteria (orange) trapped by a neutrophil (blue), a type of white blood cell. The neutrophil has trapped the bacteria with extruded material that forms a net-like structure called a NET (neutrophil extracellular trap). The neutrophil will engulf (phagocytose) the bacteria and destroy them as part of the body's immune response. N. gonorrhoeae is a Gram-negative bacteria that causes the sexually transmitted infection gonorrhoea. Magnification: x110,000 when printed at 10 centimetres tall.